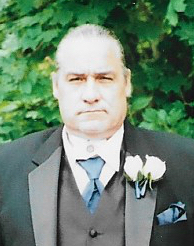 RICE, BRUCE A. SR., 58, of Harbour Ave., passed away on Thursday, March 14, 2019. He was the beloved husband of Mary Ann (McKay) Rice. He was a son of George E. Rice Sr. and the late Carol A. (Shadeck) Rice. Bruce served his country in the United States Marine Corps and then worked in construction for various firms throughout the state. He was a passionate lifelong fan of the New England Patriots. Bruce is survived by his children; Carley Rice, Bruce Rice Jr., Traci Kozakiewicz, Jennifer Tetreault, Albert Tetreault, and Melissa Tetreault. He was the brother of George Rice Jr., Joseph Rice, and the late James Rice. A funeral service will be Saturday, March 23, 2019 at 10:00 am in the IANNOTTI Funeral Home, 415 Washington St., (Rte. 117) Coventry. Interment with Military Honors to follow in RI Veterans Cemetery, Exeter. Visiting hours Friday 4 - 7 pm.